A British ban on ivory sales is to be one of the toughest in the world, the environment secretary has said. Michael Gove said the sale of ivory of any age, with limited exceptions, will be banned in an effort to reduce elephant poaching. The move, which is still to be signed into law, comes after a consultation in which more than 60,000 people supported the introduction of a complete ban. Campaigners say about 20,000 elephants are killed each year for their tusks. Previous bans only applied to ivory produced after 1947. The new law is even tougher than the changes proposed in the October 2017 consultation. Can China's ban save elephants? Mr Gove added that the new law would "reaffirm the UK's global leadership on this critical issue, demonstrating our belief that the abhorrent ivory trade should become a thing of the past". 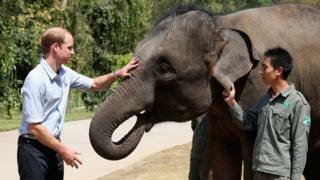 He said: "Ivory should never be seen as a commodity for financial gain or a status symbol." Those breaking the ban by selling ivory will face a maximum penalty of five years in jail or an unlimited fine, said the Department for Environment, Food and Rural Affairs (Defra). It added that the measure was tougher than rules in China and the US. The US currently bans ivory apart from items older than 100 years, as well as items with up to 50% ivory. The Chinese ban exempts "relics", with no specific date before which these must have been made. There will still be some exemptions to the ban, designed to provide "balance to ensure people are not unfairly impacted" and for "items which do not contribute to the poaching of elephants", the department said. Items comprising less than 10% ivory (by volume) and made before 1947. Musical instruments made before 1975 and comprising less than 20% ivory. Rare or important items, at least 100 years old, will be assessed by specialist institutions before exemption permits are issued. WWF chief executive Tanya Steele said the UK stance made it a "global leader in tackling this bloody trade" and called for "global action" to stop elephant poaching. Charlie Mayhew, chief executive of the Tusk Trust which funds conservation and environmental education across Africa, welcomed the announcement. "The ban will ensure there is no value for modern day ivory and the tusks of recently poached elephants cannot enter the UK market," he said. Alexander Rhodes, founder of Stop Ivory, also praised the strength of the ban and its tighter regulations. He did however urge the EU to "move fast" as a bloc to address the issue. "Since the UK government held the Illegal Wildlife Conference in 2014, the US and China have both enacted bans on their domestic ivory trade, so the UK doing this now is extraordinarily important," he said. "The EU on the other hand has been very resistant - I am hopeful that the UK's strong position will lead to change."